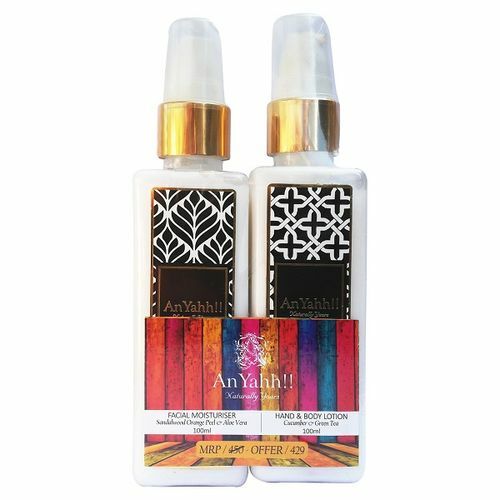 This wonderous combo of this AnYahh Moisturizer and Lotion is a total must have for those seeking firm, healthy and glowing skin. A ritual in itself, this combo will surely work wonders on making your skin flawless. Keep your skin soft and smooth with this facial moisturiser, designed to fight dryness and skin damage; leaving your skin beautifully hydrated. Sandalwood, orange peel, aloe vera and vitamin E impart powerful antibacterial, antiseptic and anti-ageing benefits; giving a healthy glow to your skin. Give your skin a silky feel by lavishing it with this AnYahh hand and body lotion. This lotion is a rich, hydrating formula that is quick-absorbing. Cucumber, green tea, vitamin E and glycerine help replenish and revitalise your skin, and improve its appearance, making it soft and youthful.